From an early age, I have always had a thing from street food. 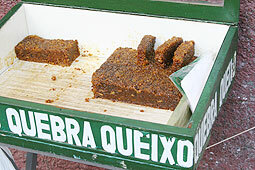 I recall being on vacation at my grandparents’ home in Fortaleza, Brazil and hearing an elderly man screaming “Quebra queixo” – a chewy sweet made with shredded coconut, lime and brown sugar that you have to work hard to eat – almost to the point of breaking your jaw. 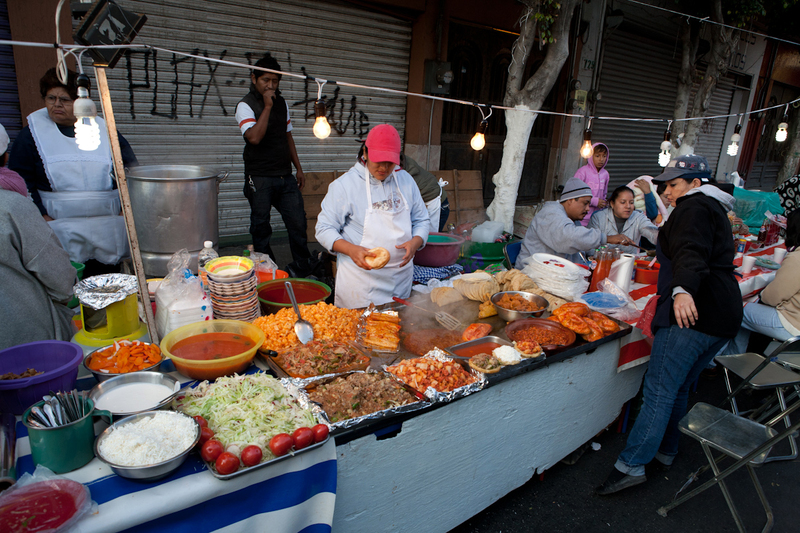 My cousins and I were crazy about the stuff, and whenever my aunt Isolda caught us buying it – or anything from street vendors – she would run out of the house screaming. As a nurse and the daughter of a medical doctor, she was (too intensely, if you ask me) worried about the hygienic conditions in which the treat was made in. Here in New York, street food for a long time meant hot dogs carts, pretzels or Halal gyros, but in recent years there has been a revolution in the genre. Food trucks have taken over the streets, and today you can find everything from Asian food to waffles, gourmet hot dogs, lobster rolls and even very specific ethnic food. Just a few weeks ago Renata and I enjoyed delicious grilled kielbasa with mashed potatoes and pickled cucumbers from the Polish Food Truck (http://polishtrucknyc.com) during an early spring street fair on Staten Island, and whenever I am around Greenwich Village on Saturday afternoon I make sure to look for a taco truck that usually stops around W4th Street on weekends. 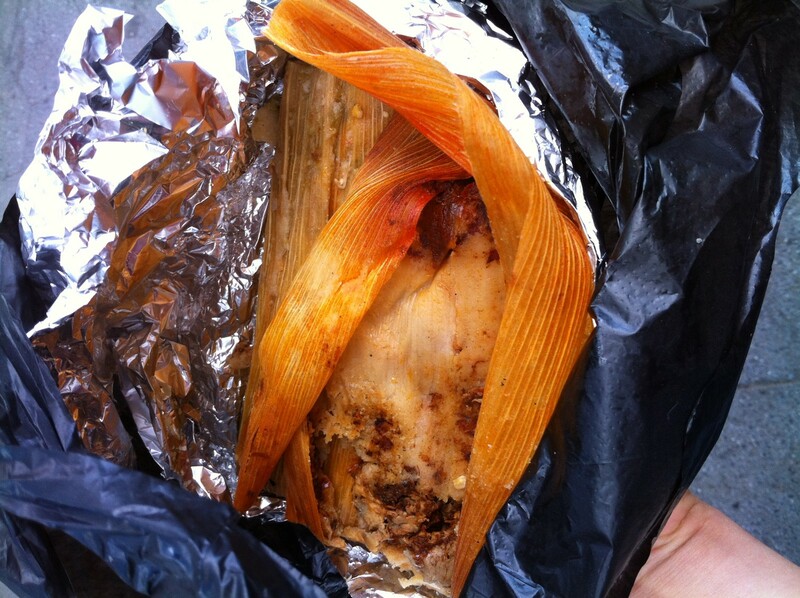 Among my favorite street food is tamales – steamed corn bread filled with chicken, cheese or whatever you like to put in them (in Brazil they are known as “pamonhas”). I often get them from a Mexican lady that sells them off a shopping cart outside the uptown 1 train stop at 137th Street and Broadway (Tamales Yolanda, 347-499-3757). I also buy them from Frutas Y Abarrotes Mexico (54 Victory Boulevard, Staten Island), a store not far from my apartment. Both make great tamales – but I still kick myself for not having gotten them in Mexico during our recent visit to Cancun. Another favorite that became a breakfast staple at our home are Santa Fe breakfast burritos, which are made with potato, eggs, chorizo, cheese and salsa wrapped into a tortilla – it’s a great option for Sunday, since it is so rich that you can actually skip lunch – and we almost always do. However, I have never bought them outside- I make them myself as I prepare to go to church. Preheat oven to 350°F with rack in middle. Cut 4 (12-by 8-inch) sheets of foil. Cook potato in a small pot of salted boiling water until just tender, about 5 minutes. Drain. Wrap tortillas tightly in a large sheet of foil and warm in oven until heated through, 10 to 15 minutes. Meanwhile, cook chorizo in an 8-inch heavy skillet over medium heat, stirring and breaking it up, until just cooked through, 3 to 5 minutes. Add potato and cook over medium-low heat, stirring, until tender and lightly browned, about 3 minutes. Remove from heat and cover to keep warm. Whisk together eggs, water, 1/4 teaspoon salt, and 1/8 teaspoon pepper in a medium bowl. Heat oil in a small nonstick skillet over medium heat until hot. Add egg mixture and cook, stirring to scramble, until just cooked through. Remove from heat. Put a tortilla on 1 sheet of foil. Spoon one fourth of chorizo mixture, one fourth of eggs, one fourth of cheese, one fourth of avocado, and then salsa to taste in vertical rows across center, leaving room to fold over bottom and sides. Fold bottom of tortilla over most of filling, then fold over sides, overlapping them. If desired, fold top down (otherwise, filling can be left exposed). Wrap foil around burrito, leaving top exposed. Make 3 more burritos in same manner and serve hot.